A question I received: The Book of Zohar states that in the year 66, the Messiah will be revealed in the Land of Galilee. What does that mean? And what will happen then? Will there be war? 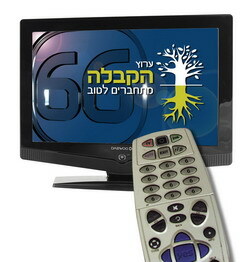 My Answer: It means that Channel 66 (our organization’s Kabbalah TV Channel) will give people the strength to correct their egoistic nature, and by doing so they’ll rise from the sensation of our world to the sensation of the Upper World. The Messiah is the force that elevates man out of egoism into the quality of bestowal! News Report (from dp.ru): The famous Russian TV reporter, M. Leontiev, believes that the only solution to the crisis is a global war. News Report (translated from utro.ru): The President of the Russian Federation, Medvedev, stated that politicians have to learn to listen to each other and to make decisions. This is the way to minimize the current financial crisis. My Comment: Mr. Medvedev is right, if what he means is that only the true, altruistic, mutual understanding will soften our fate. My Comment: One would think that Ayman al-Zawahiri himself sets an excellent example of a virtuous life – an example worthy of imitating… Still, I am sure that his appeal is sincere! Laitman.com Post: Is It Realistic for Politicians to Unite? An e-mail I received on December 18, 2008: I am writing to you because I am desperate, even though I feel extremely guilty for taking up your time. I have been deeply depressed for a long time, and the only other thing I ever feel is a lack of desire to live and emptiness. I don’t feel anything else. I listen to the lessons every day, but even when I suddenly hear and understand something, it instantly disappears before I can even remember or feel it. I participate in the Bnei Baruch dissemination projects, but it doesn’t give me strength. I am rapidly falling. Everyone is thinking about the crisis and how to come out of it, but I can’t even come out of myself. All I can feel is unbearable pain and resentment. I don’t know what to do. Please reply to me on your blog! Since you cannot come out of your depression, my advice to you is to delve into it even more than it really is: artificially push yourself into even greater self-denigration, feelings of anger, resentment and guilt. This way, by pushing yourself down with all your might, you will take control over the depression, and you will then discover just how artificial all your sensations are, how much they depend on your subjective outlook. And then, from the bottom of your descent, you will feel joy and Light! Question: Research indicates that 11 out of 100 global citizens have access to computers and Internet. How can we feel like one society when just a few of us in the world can actually connect virtually? My Answer: Initially, the connection between people was not created by the Internet, but by the Creator. Our souls are rigidly connected in one system. Thoughts and desires pass directly from soul to soul, and not through the web. Regardless of having the Internet or not, everyone will feel that they belong to the entire world in equal measure. Question: If the global crisis harms the Internet, what will happen to our dissemination and the virtual groups? My Answer: We must do everything we can to ensure that our friends all over the world can stay connected to us. If the world will need us, then we will certainly retain the opportunity to connect to the world. Perhaps we will receive even greater opportunities to do so. Question: I had an idea during the Blackpool Congress: I was thinking about old people, who are unable to use computers. I think it would be great to give them the possibility to feel unity. We could also tell them about reality, freedom of choice, and how to see the world from the point of view of Kabbalah. This could lead to more actions made by this group of “aware old people.” If I try to develop this kind of thing with the “old people group” of my town, do you think it could be useful? My Answer: One’s age is completely irrelevant when it comes to studying Kabbalah, because the soul has no age. Uniting with the idea already corrects the soul. Try it! I hope that once we reach a certain level of success in our dissemination to the masses, the television channels will become interested in our TV programs. My Comment: Prof. Tyler was right about the process, but not its outcome. He did not foresee globalization – humanity’s complete interconnection. But it is precisely the need to survive, to exist in an interconnected system, that will compel humanity to seek a method of curbing every person’s individual egoism. And when we search for a method to correct egoism, we will find that Kabbalah is the only adequate method. Question: What is your interpretation of praying for your enemies? Our Rabbi put in two words at the end of our service, “and Ishmael,” and I was extremely upset. Is this part of “love your fellowmen as yourself”? And how can I pray for someone who has vowed our destruction? My Answer: You should pray for them to stop wishing to conquer or destroy everyone who is “wrong,” because the infinite and eternal Upper World isn’t attained through violence, but through love for everyone. Question: You said in a previous blog post that “Any person can harm your spiritual path with his thoughts and desires, even unintentionally.” Does that mean only among the points in the hearts in the spiritual world? Or are we talking in the world of “beasts,” in the corporeal world as well? My Answer: There is one world, but in our consciousness it divides into the part that’s revealed to us and the part that’s concealed from us. We influence both parts as one whole.